There are different factors to take into account, including exposure to pesticides, types of pests, diseases, hive placement, temperature, weather conditions, and others. 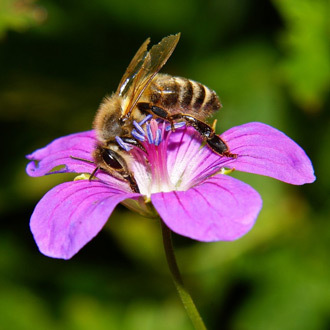 Speaking of location, keep in mind that bees prefer certain blossoms over others, examples being fruit trees, sage, goldenrod, dandelion, clover, basswood, aster, and alfalfa. Honey enjoys a growing popularity not only in Canada but around the world. What is more, beekeeping businesses produce a selection of products such as propolis, bee pollen, beeswax, and others. The average beehive produces between 9 and 27 kg a year. The average price of honey is about $5.3 per kg. And the good news is that there are many places to promote and sell your produce, including bakeries, harvest festivals, craft fairs, gas stations, grocery stores, malls, health food stores, and farmers markets. To start a beekeeping business in Canada, you may need permits and approvals, implements and equipment, a business plan and financing, and of course, bees. The required permits and licenses vary from one province to another. In Ontario, for example, beekeeping businesses are regulated under the Food Safety and Quality Act and the Ontario Bees Act. All businesses are required to register on an annual basis with OMAFRA (Ontario Ministry of Agriculture, Food and Rural Affairs). Beekeeping businesses are required to obtain permits when honeybees leave the territory of Ontario and in other occasions. For your beekeeping business, you will need a bee brush, smoker, beehive, feeding and extracting tools, hive tools, and others. You will also need things like an outer cover for your hive, containers, extractor, queen excluder, gloves, bee suit, veil, and so on. Developing a good business plan is an important step to secure affordable external financing for your business. The main sections of your plan include your production and marketing plan, goals, business organization, business profile, targets, and financial plan, and others. It is a good idea to include a section on your business operating history, including details such as weaknesses and strengths, labor and management expertise, resources, size, and year of operation. You may want to describe your short-term and long-term goals as well, for example, to diversify your products, build equity, maintain implements and tools in good condition, etc. In your marketing plan, focus on your competitive advantages, price trends, competitors, target market, and potential customers. You may want to include details such as per capita consumption, consumer preferences, and others. To prepare your business plan, use different sources such as magazines, industry periodicals, conferences, and industry associations. Different sources of financing are available in Canada, among which private and government-sponsored loans, grants, financial assistance by associations and non-government organizations, peer to peer networks, and others. Loans are offered to businesses that need technology financing, want to purchase tools and equipment, and need working capital. Life on Credit has detailed information on the subject. Canadian credit unions and banks offer expansion and start-up loans with competitive rates, capital payment holidays, long amortization periods, and other beneficial features. Under the Canada Small Business Financing Program, businesses are offered financing to purchase equipment, to make leasehold improvements, and to purchase immovables and real property. Decontamination costs that have to be paid under provincial and federal legislation are eligible as well. Other types of financing in Canada include loans for rural entrepreneurs, financing for persons with disabilities, loan guarantees for capital purchases, financing for Aboriginal entrepreneurs, and many others. Financing is also offered to persons with addiction and mental health problems. was founded back in 1940 to help beekeepers across Canada negotiate fair marketing, grading, and labeling practices. Today, the council serves as a forum and meeting point for different industry players, including government officials, provincial associations and organizations, professionals, packers, producers, and others. The council offers information and educational resources such as the Beekeeper’s Handbook and a national magazine. The magazine features updates, regional reports, professional advice, how to videos, and a lot more. there are some 280,000 colonies in Alberta, 100,000 colonies in Saskatchewan, 97,500 in Ontario, and 73,800 in Manitoba. Ontario and British Columbia have the highest number of beekeepers, 3,150 and 2,323 respectively while New Brunswick and Prince Edward Island have the lowest.